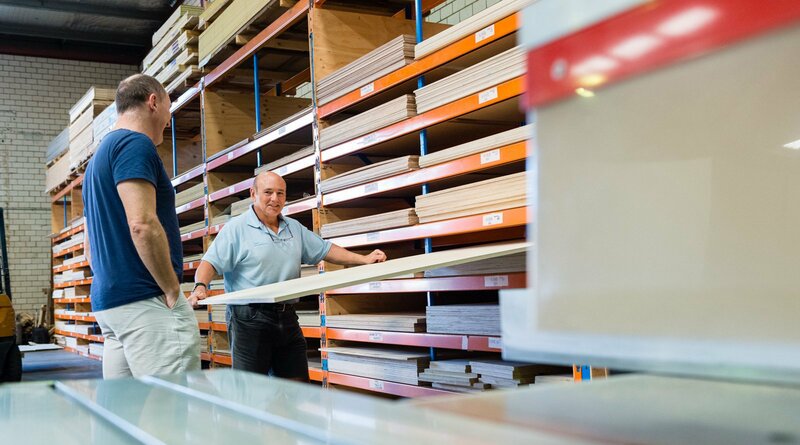 Bruynzeel is the leading supplier in Sydney for all your plywood, timber and wood panel needs. Whether you’re a major building contractor, a tradesperson, a homeowner or a student doing a school project, we can help you. We are a family owned business that has been committed to quality products and customer service for more than 49 years. We specialise in quality flat panel products sold at highly competitive prices. The highly experienced team at Bruynzeel are your instant solution for full spectrum plywood and wood panels in Sydney. Just tell our experts what you need. You’ll get great professional service and all the purchasing help you need. For large jobs we have the capacity to source large volumes of materials. Our product range includes a variety of quality board and timber products. Cutting: We can even custom-cut your panels to size (straight cuts only) and save you some time and money. Cutting diagram required. Please refer to our Cut To Size page for pricing. Easy pickups: You can also come to our warehouse and pick up your timber. We have onsite parking – if you wish to pick up goods and it’s raining, just drive straight to our warehouse and load undercover.